Oak, yew, and bone work well for channeling magic. Plus, it hurts when you hit somebody with them. 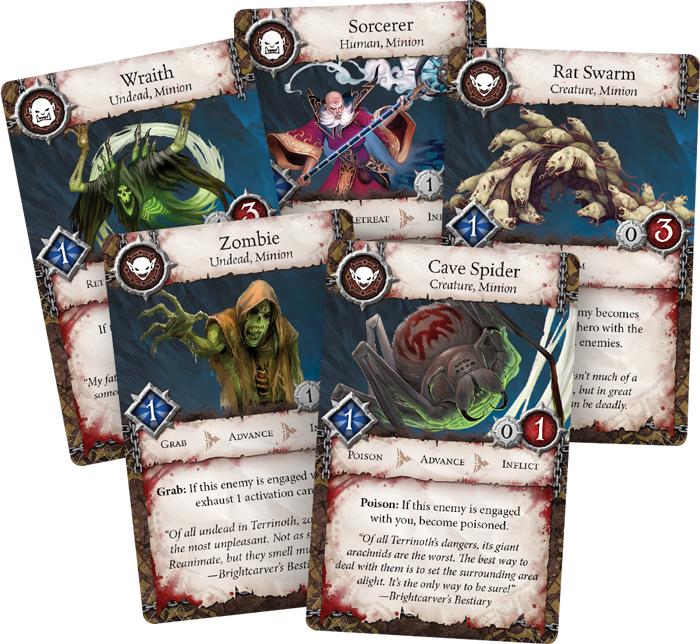 Terrinoth is in peril and now the realm looks to you for a savior in Heroes of Terrinoth! The restless dead rise in the Mistlands, the Bloodguard sow discord in the Free Cities, and even the Land of Steel is no longer safe as tales of marauding goblins travel along the roads. 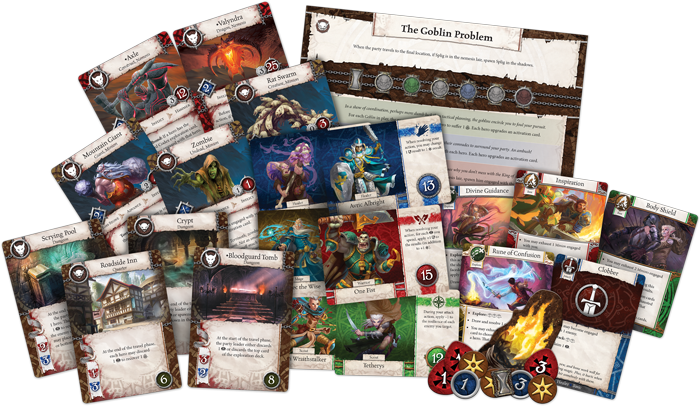 You must step into the shoes of a hero and journey into the darkest dungeons and caverns, seeking out the dangers that threaten Terrinoth and casting them down. And if you happen to get rich along the way… well, what's the harm in that? 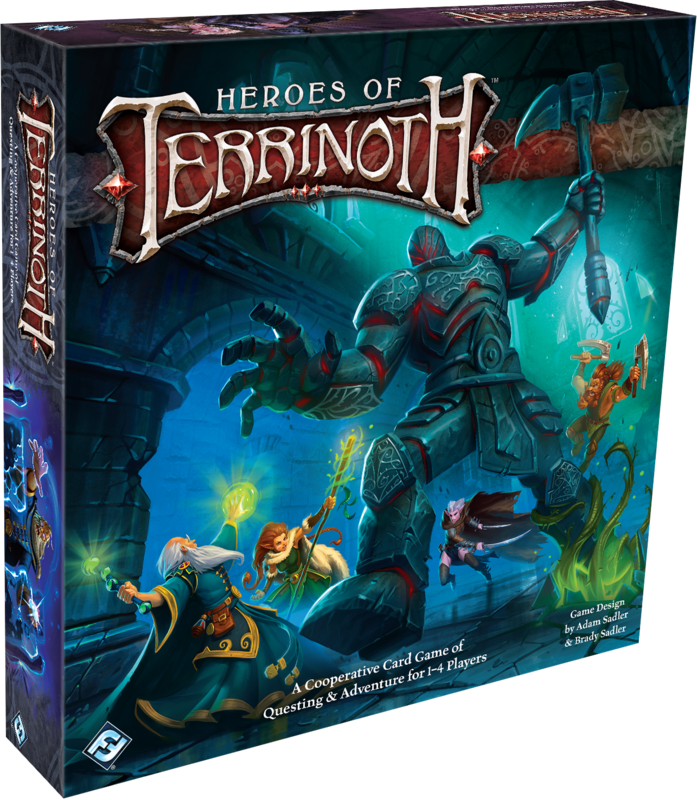 Heroes of Terrinoth is on sale now at your local retailer or online through our website! In this cooperative card game of questing and adventure, one to four players choose from an array of twelve distinct heroes, spread across four possible archetypes: healer, warrior, mage, and scout. Each hero has a special ability reflecting the skills and talents they've learned along the way, and as you gain more experience through your quests, you'll have the chance to grow from a fledgling student to a true master of your art and specialize in different classes. How you choose to advance you character depends on how you build your party—which skills your allies have mastered, and which areas still need improvement. The paths available to each hero often borrow lessons from other archetypes, allowing you to build a well-rounded party. 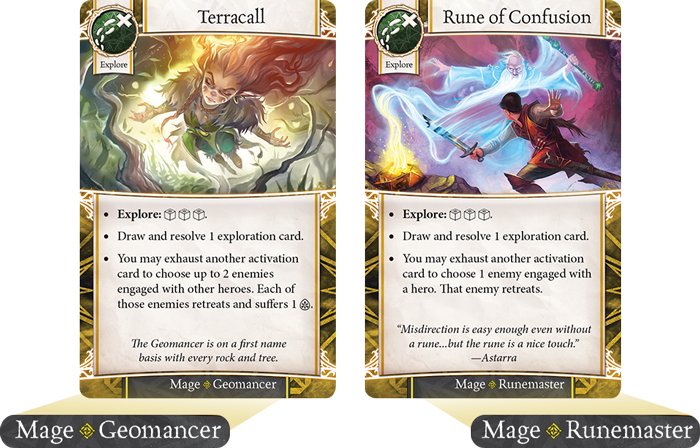 For example, a mage can choose to become either a Geomancer, which helps them to fight like a warrior, or a Runemaster, who can evade as skillfully as a scout. Both options remain true to the heart of a mage by striking from a distance with magic, but once you take command of your hero, the choice is yours alone. Once you have assembled your heroes, your adventures begin! Over the course of eight quests, you will face heroic tasks, saving helpless townsfolk, slaying deadly monsters, uncovering devious plots, and recovering priceless artifacts. With unique objectives, setups, and rules, no two quests are the same and every adventure will challenge you in new ways! 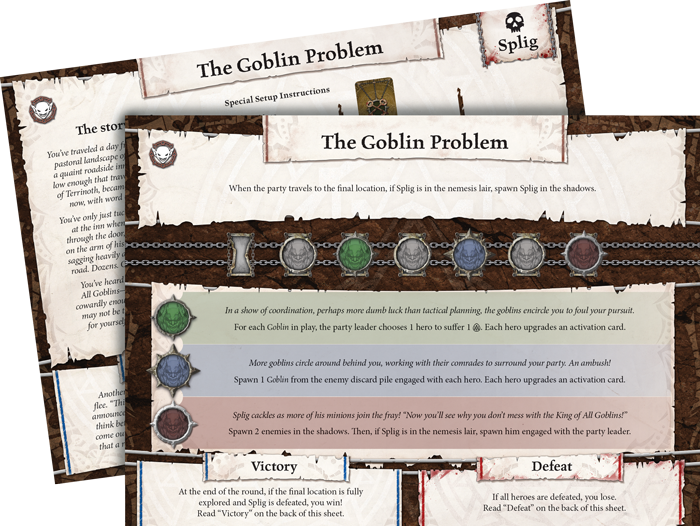 Your first mission is to handle “The Goblin Problem.” For an in-depth look at this scenario, you can check out our last preview here. Rumors are circulating outside Goldhall about a bold troop of goblins, who attack travelers on the road in broad daylight. This is the perfect chance to test your skills, and the hoard of a goblin king may be worth its weight in gold. Once you set out on your quest, your game progresses in four phases every round: Hero Phase, Enemy Phase, Peril Phase, and Travel Phase. During the Hero Phase, which you can learn more about here, your team uses Activation cards to perform actions—holding off enemies, aiding your allies, or forwarding the objective by exploring the territory. Then, your antagonists advance and get their chance to strike back during the Enemy Phase, which you read more about here. The strain of your mission will inevitably take its toll during the Peril Phase. And finally, if you have plumbed the depths of the current area, you can advance to a new location during the Travel Phase. No matter where you go, danger lurks just out of sight in the shadows, but if you can balance your strengths and face the darkness together, the adventure of a lifetime awaits! Terrinoth needs heroes. The powers of darkness have taken hold of the realm, and only the bravest champions can restore peace. Do you have what it takes? Assemble your team, stand fast against the darkness, and embark on an adventure worthy of song! Pick up your copy of Heroes of Terrinoth (TER01) at your local retailer today or on the Fantasy Flight Games website here!